Angela Ambrose began her writing career in 1987, producing videos and publications for Fortune 500 companies and the US Public Health Service. She is an American Council on Exercise-certified group fitness instructor specializing in yoga, indoor cycling and cardio classes for seniors. Ambrose holds a Bachelor of Arts from the University of Illinois. Sit down in a chair or on the floor on a folded blanket or cushion. Keep your back straight from the base of your spine to your neck. This creates a straight path for energy to flow up your spine. Close your eyes to prevent your mind from being distracted by outer objects. Allow your breath to slowly deepen as you inhale and fully inflate your lungs, counting silently to four. Feel your ribcage expand forward and to the sides as you breathe in. Empty your bowels and bladder before you begin. Shower or wash your face so you will feel more alert. Roll out your yoga mat and do a physical practice before meditating. The yoga poses will help stretch and strengthen your body. Focus on poses that work your abdominals, to strengthen your spine, and hip openers to prepare your body to sit in stillness. Set aside time each day to meditate. Choosing the same time and place for your practice will help you create a regular routine. When you can sit comfortably in meditation for three to five minutes, increase your time to 10 to 15 minutes. 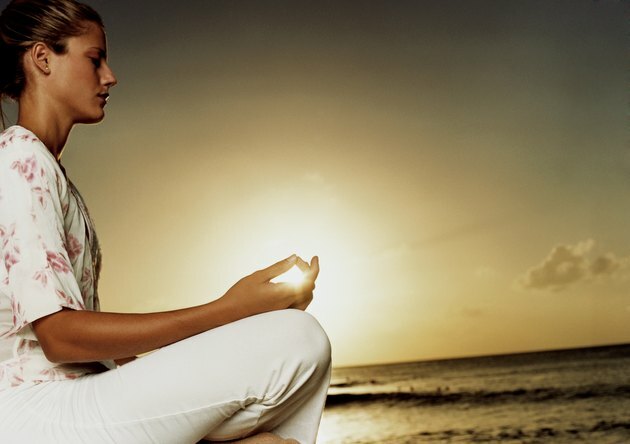 As you gain more experience, gradually lengthen your meditation time to 30 minutes or longer. Sit upright whenever meditating. Reclining on a couch or lying on your back make it more likely you will doze off. The exhalation is the most important part of the breathing cycle. Breathing out completely will create more room for a deeper, fuller inhalation. Full exhalations help remove impurities that have accumulated in the lower part of your lungs. Avoid eating a big meal before meditating to prevent feeling tired or falling asleep. Never force or strain your breath. Strive for steady, rhythmic breathing that flows easily. If deep breathing causes dizziness or lightheadedness, slow down your breath or return to normal breathing.